At one point, he solemnly queried, "If the President doesn't change the language, if your language is not accepted, you and your 11 colleagues who voted yes the last time will vote no this time. Does that mean you're prepared to take responsibility for bringing down this whole bill?" Notice that Stephanopoulos placed the obligation on Stupak and not on pro-abortion Democrats who, one could argue, are more concerned with that issue than with passing health care. Earlier in the segment, the ABC journalist grilled, "So, if the President doesn't change the Senate bill, you can't vote for it?" In the previous segment, Stephanopoulos talked with Health and Human Services Secretary Kathleen Sebelius. Pivoting off her denial that the bill funds abortion, the former Democratic operative turned journalist focused, again, on whether Stupak could vote for the legislation. Stephanopoulos insisted to the Michigan Congressman, "She said the President's bill, the President's proposal, does not change the status quo on abortion, does not have federal funding on abortion. Do you agree? And can you vote for it?" 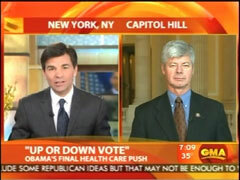 Now, the network anchor did challenge Sebelius by wondering, "Well, as you know, Congressman Stupak simply disagrees. He says the Senate bill does do that [fund abortion] and President's proposal does do that." But, Stephanopoulos did not press the HHS secretary on whether abortion was more important to Democrats than a bill. And, considering that the restrictions on abortion funding were in the House bill, but have been stripped out of the Senate version, he didn't ask if pro-choice Democrats were "mutinying" against their pro-life colleagues. GEORGE STEPHANOPOULOS: Let's bring in Congressman Stupak now. And, Congressman, you heard Secretary Sebelius there. She said the President's bill, the President's proposal, does not change the status quo on abortion, does not have federal funding on abortion. Do you agree? And can you vote for it? BART STUPAK: Well, no one has seen the President's bill yet. We've seen proposals. The President indicated yesterday four more proposals he'd like to incorporate. So, we want to see the bill. But, the bill that they're using as the vehicle, is the Senate bill. And if you go to page 2,069, through page 2,078, you will find in there, the federal government would directly subsidize abortions. Plus, every enrollee in the Office of Personnel Management enrolled plan, every enrollee, has to pay a minimum of $1 per month toward reproductive rights, which includes abortions. STEPHANOPOULOS: So, if the President doesn't change the Senate bill, you can't vote for it? STUPAK: No. We're not going to vote for this bill with that kind of language in there. The President says no federal funding for abortion. I have eight pieces of legislation we currently have in federal law that says no public funding for abortion. Take any one of these and insert the language. And we'll be happy. We can support this legislation. We voted for health care before. I want to see health care pass. I agree with the Secretary. People are being priced out of the market. We must have health care. But, boy, there's some principles and beliefs that some of us are not going to pass. STEPHANOPOULOS: But, Congressman, how can you do that? As I understand the process, that kind of abortion language cannot be tied to the reconciliation bill. It would be knocked out of the reconciliation bill. So, there's no way to change the Senate bill. STUPAK: We did welfare reform under reconciliation when President Clinton was in. SCHIP SCHIP, the State Children's Health Initiative Program was passed through reconciliation. You can do it. If there's a will, there's a way. That's just an excuse they're giving. Look, give us the language. Let's keep the current law. No public funding for abortion. Let's pass health care. Affordable, quality health care for all Americans. That's what I want to see done. STEPHANOPOULOS: Have you asked the President to put your language in the bill? STUPAK: We've repeatedly told his staff, here's what we need. Yes, I had a discussion with the President back in September, before we had our amendment back on the House floor. You know, it's there in current law. They keep saying they want to maintain current law. Take their choice. There's eight programs out there. Just keep the language. STEPHANOPOULOS: But, let- Let me be clear here. STEPHANOPOULOS: If the President doesn't change the language, if your language is not accepted, you and your 11 colleagues who voted yes the last time will vote no this time. Does that mean you're prepared to take responsibility for bringing down this whole bill? STUPAK: Yes. We're prepared to take responsibility. I mean, I've been catching it ever since last fall. I mean, lets face it: I want to see health care. But we're not going to bypass some principles and beliefs that we feel strongly about. And the President, he has shown flexibility. He's putting in Republican proposals. Look, let's keep current law. No public funding for abortion. Lets pass health care. STEPHANOPOULOS: And if he accepts your abortion language, quickly, will you vote for the bill? STUPAK: We'll read it. We'll make sure it's a quality piece of legislation. Members are not interested in voting for the Senate bill. That's for sure.